Royal and noble units have slightly stronger stats and level faster than normal units.Erf-b1-p079a Cities ruled by Royals may pop Nobles and more Royals. All Royals are descended directly from the original 99 kings and queens created directly by the Titans' own hands. "Lord" and "Lady" are generic titles for Nobles of any rank (as well as Parson). King Slately LIAB Text 42 listed the following Royal Ideals, though there may be more than those listed here. (Presumably the missing list includes Duty.) Since Loyalty is also a unit's attribute, the others may be as well. 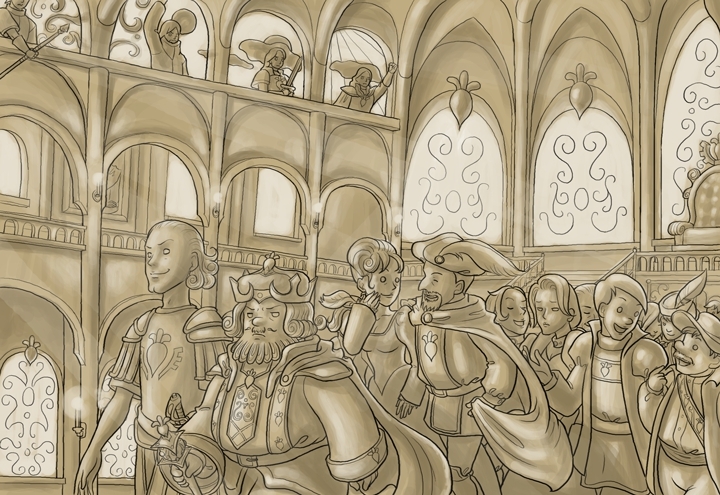 Some Royals subscribe to the ideology of Royalism, the belief that they were meant by the Titans to rule over Erfworld, and that non-royal and non-noble units are not fit to rule. These beliefs are challenged by the ideology of Toolism, which emphasizes atunement to the Arkentools as the ultimate source of divine right to rule. Jack Snipe - Jack (or Knave) was his title, as well as his name; this indicates a position of a servant. It is not a military rank or official position, however, and fulfills the same purpose of a noble title. Practically, Jack enjoyed the same treatment as Lady Wanda Firebaugh, as both were Casters. That he is given a title at all is interesting, as it is seemingly rare; most non-noble units simply use military ranks for the purposes of hierarchy and social interaction. It is possible that sides ruled by Nobles have a further diluted variation of this mechanic, enabling Nobles to be popped in the capital as the ruler's own progeny, but nowhere else. Royals and Nobles are presumably only created when popping commanders, since Delkey was snobby towards Homekey for promoting Warlords instead of popping them. It might take longer to create a Royal than it does a Noble, and longer to create a Noble than a non-Noble (though Turnamancy can accelerate this process). Caesar Borgata, a Viscount, is described as being "barely a Noble", suggesting that a Duke is likely to have slightly higher initial stats than a Count, who is likely to be slightly higher than a Viscount. It's possible free will is a innate trait to Royals, as most of the non-Ruler royals are described as ornery and contrary to their progenitor's wishes. Many Royal and Noble Characters (especially Prince Ansom before his Decryption) believe Royalty and Nobility are the signs of Titanic mandate to rule. In fact, the purpose of the Royal Crown Coalition was to defend this belief against Stanley, who believes Titans favor those with the Arkentools. The only Noble titles seen thus far are Duke, Count, Viscount, and possibly Lord/Lady. Other potential titles could include Baron, Earl, or Marquis. This page was last edited on 21 April 2018, at 15:21.